For more than three decades, The Studio-B&H has been an NAB Show stalwart, using its Central Hall location to show off the latest gear for broadcast professionals. This year, however, the company didn’t just show off the gear but, rather, showed what the gear could do through a series of live panel discussions from its in-booth stage. Over the course of the show, The Studio-B&H streamed 32 events, including technology demonstrations, in-depth presentations on industry trends, and panel conversations that explored broadcasters’ present challenges and future opportunities. The Studio-B&H live-streamed every presentation directly to its YouTube channel using three Sony PTZ cameras, a NewTek TriCaster, and Teradek Slice. Approximately 20 minutes after each presentation, videos were uploaded to The Studio-B&H’s NAB Show Live page for on-demand viewing. 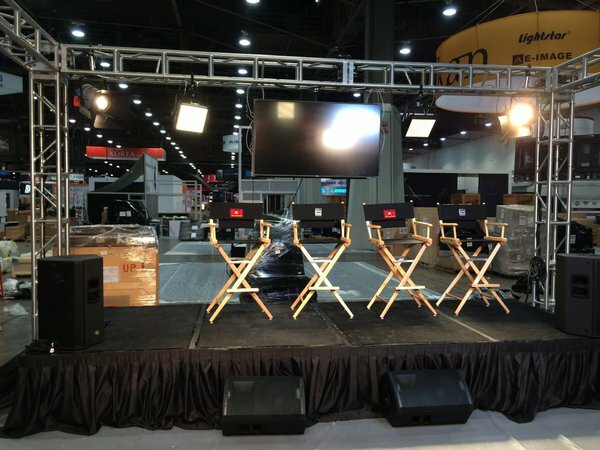 The Studio-B&H live-streamed presentations from its booth at NAB 2016. In addition to the technology demonstrations spotlighting new products from such companies as Panasonic, Sony, and Canon, The Studio-B&H programmed a series of panel discussions on buzz-worthy topics. A panel discussion titled “UHD, HDR, and VR: A New Landscape in Sports Broadcasting Technology” brought together industry executives Canon USA Senior Fellow Larry Thorpe, Fighting Irish Digital Media Lead Technologist Scott Rinehart, and BigLook360 CEO/Executive Producer Lance Loesberg and moderator Ken Kerschbaumer, SVG executive director, editorial, for a spirited discussion on how trends like UHD, HDR, and VR will affect sports broadcasters. For The Studio-B&H, the event opened a new way for the company to engage with its customers at NAB 2016, not only by showing the capabilities of its technology but by sparking industry discussions and demonstrating its broadcasting expertise.